There is no better way to say thank you to loyal customers or to reach out to potential clients than with some branded promotional items. Free giveaways featuring company logos and contact information tell people you’re thinking about them, want them to have something useful and keep your company name fresh in their minds. But choosing the right item to give away takes a lot of thought and incorporates several factors. It needs to be of a high enough quality to last and useful enough so that people are constantly focusing on it, which gives free advertising for the brand. But it also needs to be affordable enough to purchase in bulk so you can give them out at big public events without breaking the marketing budget. Finally it needs to appeal to newer consumers trends, especially things like environmental health. So many these days are turned off by the waste and pollution created by cheap plastic pens and mugs that by turning to an eco-friendly and infinitely reusable freebie such as an useful eco friendly bottle will do wonders for your company promotion. 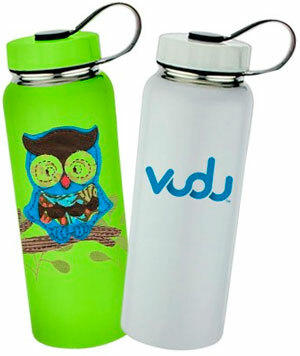 The common knock against water bottles when used as promotional items is the waste they produce. They care revered among companies looking to get an edge in the promotional items game because they are cheap to mass produce, lightweight for guests to carry around and provide plenty of room to place company branding. Plus unlike things such as stress balls and cheap pens a water bottle affords plenty of re-usability. You can avoid all the negative environmental concerns while still taking advantage of the usefulness of this item with great stainless steel bottles from CustomEarthPromos. These bottles are made from earth-friendly recycled stainless steel that is long-lasting and won’t leave an aftertaste in the beverage. Company information and colors can be imprinted on the outside with organic dyes as well. The entire bottle is eco-friendly and provides a great impression of your company’s commitment to environmental health while giving potential customers a product that can be used over and over again. Thanks to the stainless steel these bottles are solid and durable and feel that way, but the actual cost when purchased in bulk is quite low. It makes them a great addition to any promotional giveaway no matter the size, from office events to large public trade shows. This entry was posted in Promotional items on October 26, 2012 by Mommy Yam.